U.S. 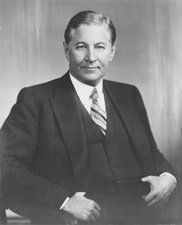 Senator James E. Murray (1876-1961), Democrat of Montana, strongly supported the Bergson Group’s campaign for U.S. action to rescue European Jewry. Murray, by contrast, became an active supporter of the Bergson Group’s Emergency Committee to Save the Jewish People of Europe and was a co-sponsor of the Bergson-initiated Congressional resolution in late 1943 which urged FDR to create a government agency to rescue Jews from the Holocaust. Baumel, The Bergson Boys p.105.